Topical flea and tick formulas like Frontline Plus etc. (fipronil/s-methoprene) kill adult fleas and ticks with an insecticide, and also kill flea eggs and larvae with an insect growth regulator drug. Frontline Plus drops are applied to the nape of the dog's neck (just above the shoulders), and provide protection for one month. 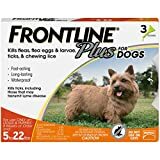 Frontline used to be my first choice for flea and tick prevention. It is a product which serves a certain population of people who only want to buy flea and tick prevention over-the-counter.I would strongly recommend changing to an oral preventative option. Oral preventatives have been shown to be more effective, longer, and you don't have to worry about the greasy application spot along their back - did it all soak in? did I bathe too soon? did my kids touch it? is it on my furniture? Frontline is not a terrible product; there are just better options available today. Frontline kills adult fleas and ticks and also the eggs and larvae. It can be very easily applied on your dog's neck and it lasts for 30 days. It has very good results especially on hot months that help fleas multiply. It works great for fleas! But, for ticks in my neighborhood not so good. I know frontline is not a repellent, so ticks and fleas can get on animal and bite him, but still, I had a full tick on dog with frontline, that sucked surely for more then 2-3 days. For fleas, there are no problems. Frontline plus was prescribed by my veterinarian for flea and tick prevention. It is a liquid medication that goes on your dog's skin. It lasts for a month at a time and then needs a reapplication. It is very easy to use and extremely effective in my experience. My only complaint is that because it is a topical medication, the strong odor and texture lasts on your dogs fur for about 24-48 hours. Also, be careful about bathing your dog 48 hours prior or after application, as it can diminish its effects. It is working well for managing fleas infestation and preventing it (when used regularly). Unluckily it appears to stop working on ticks in some countries. Owners need to use it more often (every 3 weeks) and it still doesn't prevent catching some ticks. Frontline Plus (Combo) is more effective then normal Frontline. I have used Frontline for years and always with success...with short-haired dogs. I have a long-haired mixed breed and we had the most difficult time trying to get the vials to the skin. We finally resorted to using a chewable. This is an easy-to-apply way to prevent fleas from becoming a problem on your dog and in your home. Really, it doesn't get much easier than this! Every now and again, it seems to give my dog a brief period of having an upset stomach, though. That said - fleas are certainly enough of a nuisance for him and us that it's still worth that risk to use something that's effective against fleas. Living in a rural area, we see a noticeable decrease in fleas when we use Frontline. It's super effective with any of my pinschers, as they have short hair and it makes easier to the chemical to distribute around all my dog's skin. The ticks fall out dead (at least like 75% of them are dead) in less than a day. But in my Golden Retriever (long hair) it takes longer to act, and in some areas it looks like the chemical didn't even reach in the first place. And also, when the ticks fall, they mostly fall alive, so basically I need to apply another treatment apart from the frontline vial with him. Fleas, lice, ticks and bugs are something that every dog owner fears but fortunately it is also something very easy to control and fight. Frontline Plus is one of the many products available on the market that will help you do so and its effectiveness is undeniable. Applying it is very simple, you just need to dispense a few drops in between your dog’s shoulder blades; every box comes with instructions and dosage in case of need. You can purchase Frontline Plus in most vet studios/pet shops and from online reliable sources. 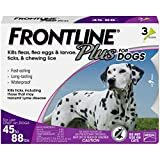 Frontline is a topical medication used to control fleas, ticks and biting lice in cats and dogs. This product comes in a spray and spot-on formulation. Temporary irritation at site of product application may occur. This product has been on the market for several years, therefore fleas have mostly become resistant and many veterinary clinics are dropping it from their shelves. Discuss with your veterinarian the best flea and tick preventative for your pet. The use of routine, effective flea treatment will prevent a flea bite becoming a flea infestation. Always respect the dosage instructions (don't use a 30kg dog dose on a 10kg dog) and seek advice from your veterinary team if you feel your flea control regime is not working. Some owners are reporting that fipronil-based products are not working as effectively as they used to, but so far there is no evidence of resistance in the flea population. 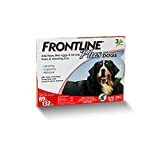 When Frontline was first released it was very effective at flea control but the fleas have now become immune to the medication. It is no longer effective in flea prone areas of the country. I live in Florida, and Frontline does nothing to keep the fleas off my dogs. As soon as they step outdoors they are instantly covered in fleas again and bring them into the house to create a full-blown infestation. I ceased buying Frontline because it no longer works.